Sometimes an author strings her words together so beautifully that I want to weep at the music that fills my head. 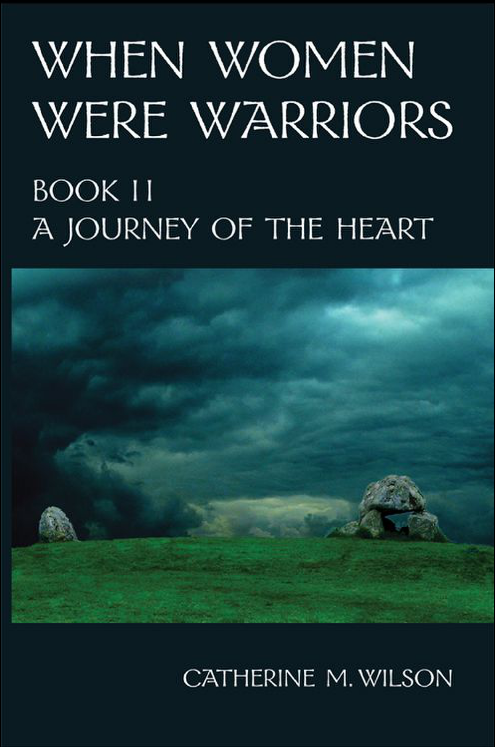 Catherine M. Wilson has managed to keep the moll of The Warrior’s Path so finely tuned throughout A Journey of the Heart that my chest hurt from the notes within. And yet there is nothing new and especially unique in the When Women Were Warriors serial. One thing is different. In this serial both men and women are warriors and Tamras’ society is matriarchal. In neighboring countries that is not so. Ms. Wilson shows us that a matriarchal society is as full of contradictions as any other society. One of the characters, Virtel – the “baddie”, is aggressive and warlike. In A Journey of the Heart we get the impression that Virtel is ambitious to the extent that she is willing to hurt her leader, Merin. Sparrow, her apprentice, shows us a Virtel who might not be as one-dimensional as Tamras thinks of her. Maybe even life is not as one-dimensional as Tamras would like it to be. We get to see how sometimes grief/regret has the ability to draw a person closer to death. According to Ms. Wilson her story is set around 1000 BCE. At that time life was precarious and death was no stranger. I imagine the will to live would have been even more essential than it is where I live. Ms. Wilson shows how having a safe and loved child-hood, such as Tamras has had, gives one insulation in the growing up process. Both Sparrow and Maara show us the faces of what not having that in our lives can be like. However much we might want to deny it, we are probably very much products of the lives we have lived. If we grow up as slaves not owning even ourselves and live in constant fear, well, that produces a person vastly different to one with a childhood where you know you are valuable and loved and where you also have what you need to survive. In fact. When Women Were Warriors is full of situations that have no simple answers. Maara functions as Tamras’ teacher in both the physical aspects of being a warrior and in understanding the ways of the world. Nothing is easy. One of the things I really liked about A Journey of the Heart was the way Tamras had to learn how to use a bow and arrow step by step. There was none of this “all of a sudden an expert”. This is what every apprentice has to learn. Easy routes to mastery are non-existent. Me, I want to have mastery right away. I want to understand everything immediately without having to work for it. For some strange reason that never happened. Bummer! When Women Were Warriors is a serial. You will have to read The Warrior’s Path in order to get anything out of Journey of the Heart. It just so happens that The Warrior’s Path seems to be on a permanent “for free” offer.